Half of them “age out” with no home. 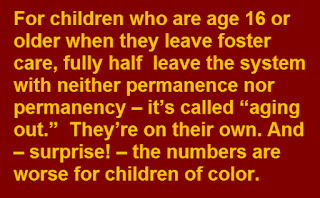 But the best way to prevent the problems besetting children who “age out” of foster care is to prevent them from ever aging in. The Annie E. Casey Foundation, (which, long ago, helped to fund NCCPR) has released some useful data on American child welfare. The report and state-by-state summaries focus on foster youth age 14 and older and what happens to them when they leave foster care. Of course we already know that the outcomes often are dismal – the new reports help us quantify how dismal. 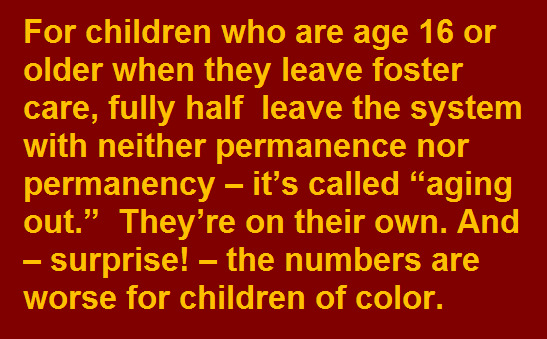 For children who are age 16 or older when they leave foster care, fully half leave the system with neither permanence nor permanency – it’s called “aging out.” They’re on their own. And – surprise! – the numbers are worse for children of color. The Casey data do not say what proportion of these children are legal orphans – that is, the process went all the way to termination of parental rights leaving them not even a legal connection to their own families. So we don’t know how much of this is a function of child welfare’s 20-year mad rush to termination-at-all-costs (discussed in more detail here and here.) But that certainly has contributed. The data also provide useful snapshots concerning racial disparities in child welfare. But all of these data need to be viewed with come caution – as does Casey’s own interpretation of the data. ● For starters, the data lump together all forms of “permanency.” It is misleading, indeed offensive, to suggest that adoption by strangers automatically is an outcome equal to reunification. Often it’s worse – and on rare occasions it’s better. Either way, the forms of permanency should be broken down separately. ● No form of “permanency” is guaranteed to be permanent (maybe that’s why they added that extra syllable.) And adoption has a disturbing record when it comes to failure. ● Data on average length of stay can be misleading. Look at the state data sheets for Minnesota and New Mexico for example, and it looks like they’re doing a fantastic job of getting children to “permanency” – the average length of stay is remarkably low. But the real reason is that in Minnesota nearly 14 percent of children torn from their families are sent back within a month – and more than half of those are returned in five days or fewer – much the worse for the experience – meaning they almost certainly never should have been taken in the first place. In New Mexico more than 35 percent of foster children are discharged from care within a month – so of course their average length of stay looks even better than Minnesota’s. These states illustrate how, sometimes, one of the worst things states do to children, needlessly tear them away from their parents, can actually make their numbers look better. In addition to the trauma of abuse or neglect that resulted in being removed from their homes and placed in the foster care system, experiences while in foster care — including frequent moves — can lead to worse outcomes for youth. That first part isn’t always false of course. But many children in foster care were not abused or neglected. And I don’t just mean the many cases in which courts get it wrong because there is no real due process for families. Children can be placed in foster care for weeks, sometimes months, before a court ever rules one way of the other. Odds are almost none of those five-day-or-fewer placements in Minnesota, for example, involved children who really were abused or neglected. 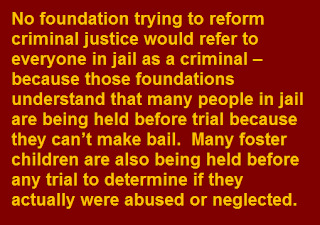 No foundation trying to reform criminal justice would refer to everyone in jail as a criminal – because Many foster children are also being held before any trial to determine if they actually were abused or neglected. 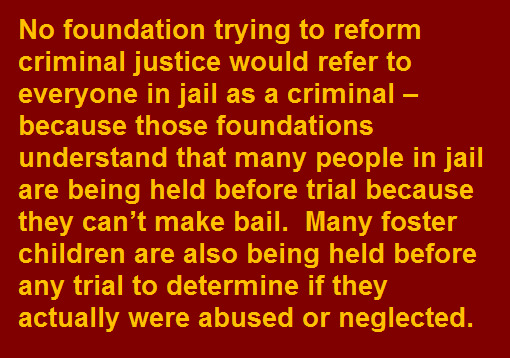 those foundations understand that many people in jail are being held before trial because they can’t make bail. The language is one more reflection of Casey’s long, steady retreat from efforts to actually curb the needless removal of children into foster care in the first place – something made clear years ago when they set up a new initiative and forgot to even mention that problem. Their focus now is primarily on fixing foster care – by curbing institutionalization and boosting kinship foster care and adoption. Sadly, that is the overall message from the new report: Now that the system has done all this harm, what are we going to do to ameliorate it with more “services” for children who age out? Still, The Annie E. Casey Foundation is about to get a new leader, Lisa Hamilton. I hope she’ll turn Casey back toward meaningful work to reduce needless foster care. I hope she will see that the best way to prevent the problems besetting children who “age out” of foster care is to prevent them from ever aging in. 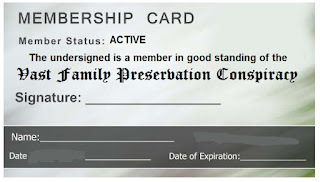 And besides, if you’re going to be blamed for supposedly using your massive resources to push family preservation anyway, you might as well actually do it. 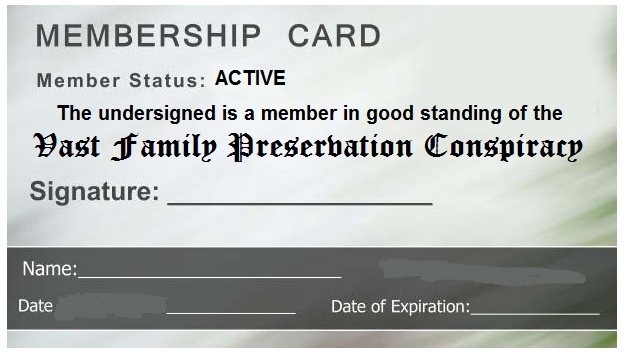 If that happens, I’ll be glad to send the folks at Casey an official Vast Family Preservation Conspiracy membership card, and share the secret handshake.